An impressive all-new design that's needlessly let down. This is a frustrating car – and a frustrating road test to write. Why? Well, the basic design of the all-new Nissan Maxima is very impressive but on several occasions we had to shake our heads and wonder why the package has been needlessly let down. This could be an fantastic car. 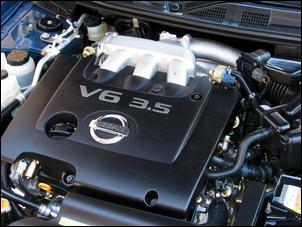 The Maxima’s V6 engine is a humdinger delivering an excellent combination of usable torque, power, economy and NVH. But it’s a pity the electronic throttle control strategy is so aggressive in urban situations. Precise throttle control has gone out the window in the quest for sporty feel - it’s impressive at first but it soon wears thin. 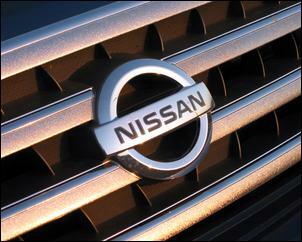 Thankfully, there’s also a whole lot of praise to be heaped onto the new Maxima. 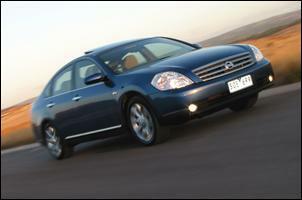 The Maxima is a big car but that doesn’t take anything away from its achieving of excellent overall cabin space. Rear knee and foot space are very impressive, even when you’re seated behind a tall front occupant. 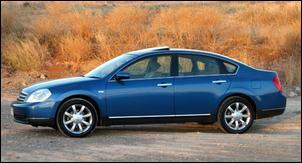 There’s also enough cabin width to give the Maxima genuine five-seater capacity. However, if you’re taller than about 185cm, you’ll find your hair constantly brushing against the rear roof lining. The Maxima Ti’s standard sunroof also eats into front headroom, but not enough to concern most drivers. Poor load access aside, the Maxima boot is easily big enough to carry several large suitcases. There’s also a ski-port through to the cabin and a full-size alloy spare wheel lurking beneath the lift-up false floor. Oh and, unlike the previous Maxima, the boot floor is perfectly flat. NVH levels are impressive in almost all situations, except for the presence of some tyre noise over coarse bitumen. The engine is also a bit throaty when working at high rpm and load – we’re not sure if this is an intentional design ‘feature’ or not. We initially found the Maxima Ti’s leather-lined seats relatively flat across the bottom but you soon sink in and get comfortable. Unlike the previous generation, the new Maxima Ti is no longer top-of-the-range – the Ti-L (which gets rear seat entertainment system and park assist) takes over that role. The middle-of-the-range Ti - as tested - is equipped with dual-zone climate control (including rear outlets), central locking with remote keyless entry, immobiliser, cruise control (with steering wheel controls), trip computer, generous interior lighting, active front head restraints, dual front and side airbags and curtain airbags. There’s also a leather steering wheel and selector knob, 8-way electric adjustable driver’s seat, 4-way adjustable front passenger seat, auto-locking doors and an electric tilt/slide sunroof. Trip computer and many other functions are displayed on a large central LCD screen. Instruments are backlit and, despite not having enough protection against direct sunlight, they offer enough contrast to scape by. There’s a tacho, speedo and fuel level gauge but only a warning light for coolant temperature. The Ti model also comes with a CD/tuner complemented by a separate 6-stacker in the glovebox, but sound quality is nothing to write home about. Of course, you also score power windows and mirrors (which are also retractable) but there are no features that really stand out. But the V6 motor is a ripper. The Maxima boasts one of the most torquey and powerful front-wheel-drive engines available in <?xml:namespace prefix = st1 ns = "urn:schemas-microsoft-com:office:smarttags" />Australia. The all-alloy VQ35DE engine (a detuned version of the 350Z’s) features DOHC, 24-valve breathing, continuously variable inlet valve timing, variable induction system, direct-fire ignition and a 10.3:1 compression ratio. Slogging out 170kW at 5600 rpm and 333Nm at a very low 2800 rpm, the Maxima laughs in the face of the Magna/Verada and Camry/Avalon – but not the 177kW/287Nm Honda Accord V6. 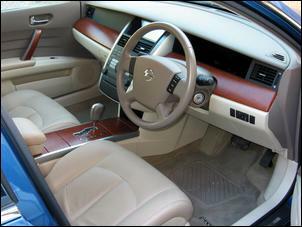 Note that all Maximas are equipped with a gated 4-speed auto transmission, not a 5-speed like some of the competition. The trans is nicely adaptive to changing driving patterns and is commendably smooth but the lack of a sequential shift mechanism is disappointing. Squeeze the accelerator pedal just a few millimetres and the 1480kg (tare weight) Maxima Ti lunges forward with often-unexpected urgency. We can’t understand why Nissan has used such aggressive throttle control strategies, especially since their wonderful V6 already makes ample torque. Top-end performance is also strong – we hand-timed 0 – 100 km/h acceleration in less than 8-seconds. Not hanging around! Fuel consumption during test was an impressive 11.1-litres per 100km, so the 70-litre tank is ample for most applications. Note that 95RON unleaded fuel is recommended for optimal performance – the extra cost of premium-grade fuel largely offsets the fuel consumption benefits. The MacPherson strut/multi-link IRS chassis is better balanced than say, a Mitsubishi Verada and you can certainly feel some activity from the rear-end when it’s provoked. There’s also the tendency to spin an inside front wheel in tight corners, but the VDC/traction control system stops things getting too ugly. The ride is firmly damped in urban conditions but becomes softer as road speed rises. The power-assisted rack-and-pinion steering arrangement is quite light and lacks feel around centre but it’s okay overall – it certainly has the on-centre response that’s lacking in many large sedans. Interestingly, there is some torque reaction through the wheel during wide-open throttle low-speed acceleration. Braking performance was up to standard during our test. Using four-wheel-discs (ventilated at the front) the Maxima pulls up quickly and controllably thanks to its well sorted ABS and EBD. Emergency brake assist is also standard. 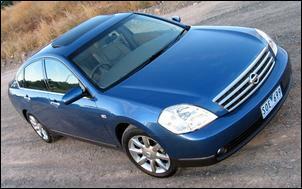 The Maxima’s appearance seems to be a love-it or hate-it proposition. The overall shape and the relatively high waistline of the new Maxima have a strong European flavour, but the fussy chrome grille and awkward lights don’t gel. 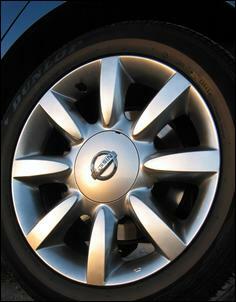 On the upside, the Ti’s 8-spoke 17 x 7-inch alloys are an attractive, fresh design that suits the car. Our test car had no major quality issues but there a few reminders that this is an affordable luxury car – not a prestige car. The roof-mounted sunglass holder and centre console lids feel cheap and the driver’s seat in our test car was loose. On the other hand, we were very impressed by the standard of panel fit and paint finish. 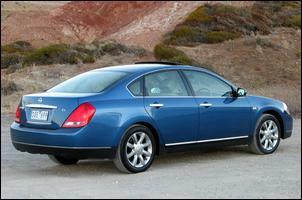 The Nissan Maxima is the latest entry into the front-wheel-drive luxury market and it’s priced to cause a shake-up. At AUD$45,990 (plus ORCs) the Maxima Ti is cheaper than the superseded model and easily undercuts the Mitsubishi Verada Xi (at over 50k) and Toyota Camry Azura (at just under 49k). It’s also much cheaper than any of the large European front-wheel-drives on the market. The only real challenge is the purring Honda Accord V6 Luxury at AUD$45,240 (see New Car Test - Honda Accord V6 Luxury. As it stands, the Nissan Maxima Ti is arguably the best vehicle in its class – but it doesn’t reach its potential.